This is a page about Phantasmagoric! 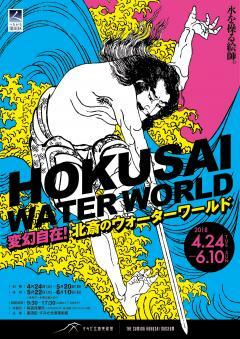 Hokusai’s Water Wonderland for the Sumida Hokusai Museum. Under the Wave off Kanagawa, from Thirty-six Views of Mount Fuji, is an iconic work known and loved the world around as The Great Wave. Hokusai’s depiction of that dynamic wave is, moreover, only one of his many works addressing the many faces of water. Portraying water, the shape-changer, is not simple, but Hokusai was able to capture its elusively decisive moments. His many works expressing the lively, fleeting movements of water speak of his acute powers of observation and his mastery of a broad range of painting techniques. What also enabled him to work in this way was his experience of residing in the Sumida area, with all its rivers and canals, and observing the flow, the rise and fall of the Sumida River and other watercourses day by day. This exhibition consists of four sections: Section 1, Hokusai Dwells in Sumida, City of Rivers; Section 2, The Great Wave; Section 3, A Waterfall Tour with Hokusai; and Section 4, Hokusai and Water, A to Z. In them we present the phantasmagoric forms of water as Hokusai and his students portrayed it. Glistening, wriggling, raising waves, as though a living thing: meet water as Hokusai depicted it to experience a water wonderland—while being astounded by Hokusai’s distinctively unconventional compositions. Under the Wave off Kanagawa, from Thirty-six Views of Mount Fuji will be on view throughout the exhibition period. The prints in his A Tour of the Waterfalls in Various Provinces, a thematic series of waterfalls throughout Japan, will be split between the first and second halves of the exhibition period. In addition, selected works from our collection will offer the delights of the many faces of water as captured by Hokusai and his students. How did Hokusai, who never ceased aspiring to become a true artist, depict water? This exhibition offers an opportunity to explore that question thoroughly. Hokusai lived for most of his life on the east bank of the Sumida River. With no buses or trains back then, people walked, crossing the bridges across the river, and used boats to go longer distances on it. The river was thus much more a part of life than it is today. The Sumida River was both Edo’s main artery for transport of goods and people and a place to relax and have fun, with party boats offering sociable spaces out on the water and the fireworks over Ryōgoku Bridge a festive summer event. The Sumida district developed because of the river; it was, indeed, a water city. Hokusai’s work includes many depictions of water, perhaps because he viewed water flowing in his daily life and observed its many faces and moods. In this section, we consider Hokusai’s life in the city of rivers as we present maps of the area from the Edo period as well as his depictions of the Sumida River and the area through which it flows. “The Great Wave” is the nickname by which Hokusai’s Under the Wave off Kanagawa, from the series Thirty-six Views of Mount Fuji, is known throughout the world. It’s a bold, powerful wave, but did you know Hokusai was about seventy when he drew it? The wave’s form has two distinctive characteristics. One is the shape of the crest, with its scattering of droplets, as though it is trying to grab something. The other is the shape of the tall wave itself. In this section, focusing on those characteristics, visitors explore earlier works by Hokusai and his pupils in which we can see the Great Wave’s beginnings. Next comes Under the Wave off Kanagawa itself, to be enjoyed in all its power and glory. Continuing its history, we examine the continuing path of the Great Wave through works that show its influence and the evolution of its expression. Following the success of his Thirty-six Views of Mount Fuji, Hokusai created, in about his seventy-fourth year, another masterly series, A Tour of the Waterfalls in Various Provinces. The eight prints in the series include both cascades that plunge straight down from a height and waterfalls that flow in peculiar curves, almost as if they were a living being. This section presents all eight prints (divided between the first and second halves of the exhibition period), plus other waterfalls by Hokusai and his pupils. Hokusai and his pupils addressed the phantasmagoric nature of water in drawing manuals, providing models for how to depict it, and in illustrated books of designs with water motifs for combs and sword guards, for example. In this section, we explore the instructions for drawing water in the manuals Hokusai and his talented successors created. Then we present a cornucopia of their works portraying water from several perspectives, including water as an element in well-known tales and works distinguishing subjects in and out of the water.